On Aug. 1, 2013, Marine Lance Corporal Matthew Grashen, a rifleman with Fox Company, 2nd Battalion, 2nd Marines, was on his first deployment. While on a foot patrol in Helmand Province, Afghanistan, LCpl Grashen stepped on an improvised explosive device (IED). The blast resulted in the loss of both his legs. LCpl Grashen spent months undergoing surgeries and recovering at Walter Reed Medical Center. He soon learned how to walk and run on his prosthetics. Now medically retired, Matthew and his wife Miya are proud parents to their two children, Jonah and Serena. Matthew keeps active with many forms of exercise, including wheelchair basketball, running, hiking, long-distance walking, swimming, and weightlifting. He will be competing the Invictus Games in September 2018. An aspiring chef, Matthew plans to attend culinary school and open a food truck featuring smoked meats. His specially adapted custom Homes For Our Troops home with a fully accessible kitchen including lower counters and pull-down shelves, allows him to practice his cooking skills. Matthew and Miya are happy to be raising their children in California, something they always wanted but previously had trouble finding a home equipped for Matthew’s injuries. They consider their home the answer to their prayers. Matthew is now able to focus his energy on continuing his education and spending time with family. Originally from Wisconsin, Matthew chose to build his home in Southern California to be close to the VA and Miya’s family. 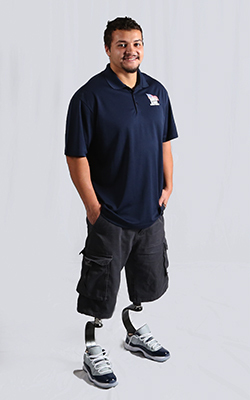 ABC7, Aug. 13, 2018 A Marine who lost his legs while serving in Afghanistan now has a special place to call home – thanks to a nonprofit organization that helps severely injured Veterans. Read more.